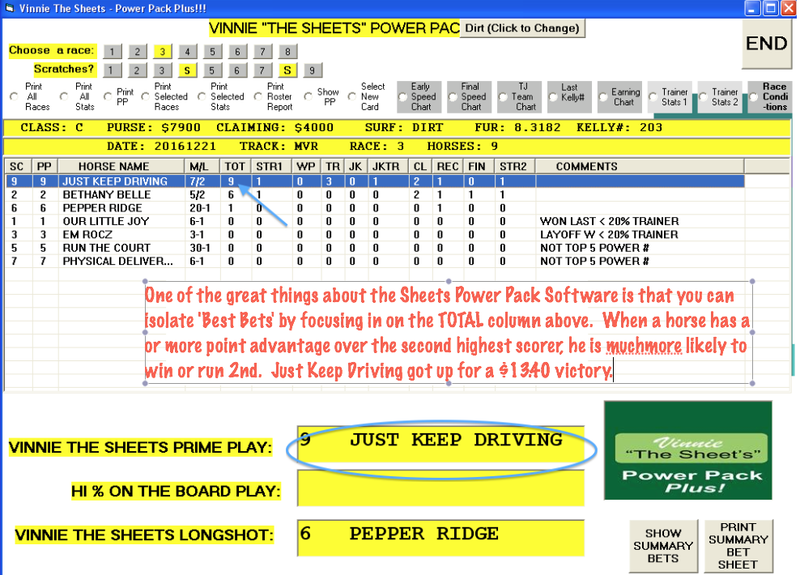 Vinnie The SHEET’S Power-Pack Software!! True ‘sheets’ technology packed into one Awesome piece of Software!!! 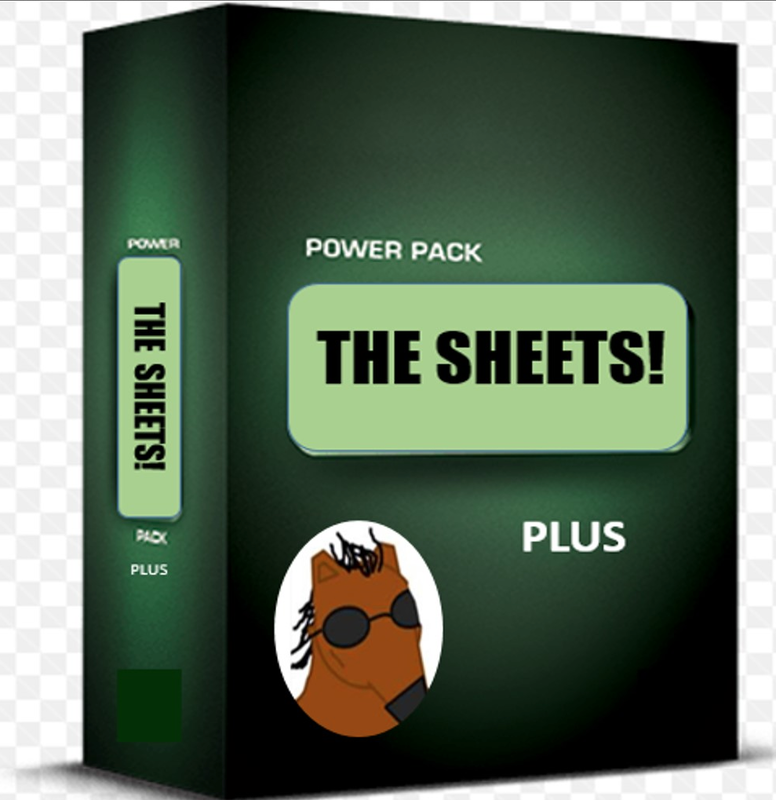 VINNIE THE SHEET’s Power-Pack Plus S0ftware!! Many of you have no doubt heard the name Vinnie ‘The Sheet’ Padula. 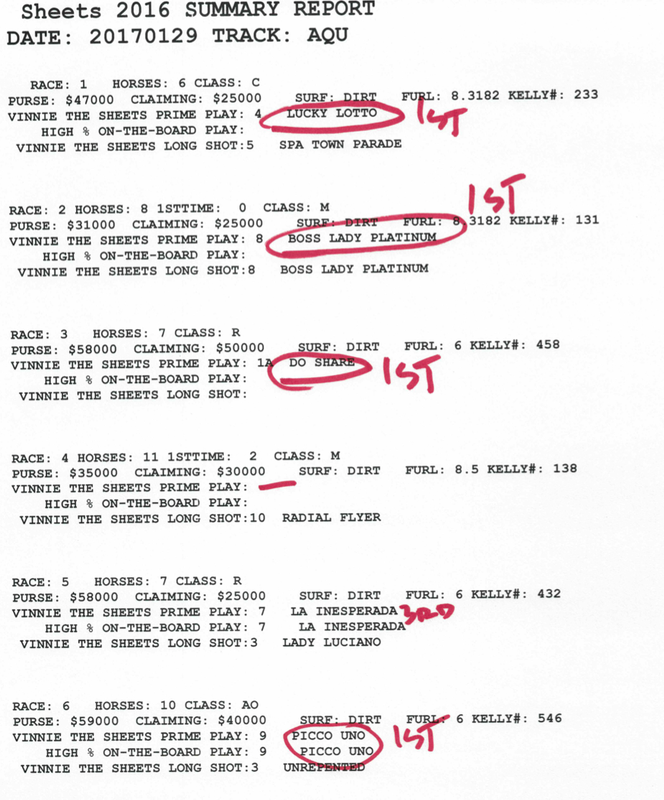 Vinnie has been producing performance rating sheets for himself and small circle of friends/clients for years now and, quite honestly, is one of the few racing pros we know who derives his entire income from a betting on the thoroughbreds. He has no business income to depend on; he’s too young to collect social security and never inherited a dime. He simply focuses on his performance sheets and plays the races for a profit. Now while Vinnie may not have quite reached ‘geezer’ age, he nonetheless recently decided that he was getting up close enough to where the daily grind of preparing the sheets was becoming a bit too much. Now we’ve known Vinnie for years and Len had suggested to him a number of times that he should at least wade into the world of software handicapping. He had politely declined saying that he enjoyed the ‘hands on’ approach. So Vinnie made the call and he and Len made plans to do several ‘sit down’ sessions to convert the Sheet methodology into modern software technology. But now, in its finished state, the program is truly a piece of software handicapping art. >>And now, with just a couple clicks of your mouse, you too can enjoy Vinnie’s very accurate and profitable Sheets in a versatile software layout. >>Vinnie has always been a strong believer in ‘Power Ratings’, I.e., ratings that measure ‘total performance’ rather than just final speed. If speed was all there was to a horserace then the horse with the highest speed rating would win a whole lot more often than the @28% national average (stats based on 6-year study of % of winners that go into a race with the highest three-race average degree speed rating – ties not included). A more accurate way to gauge a potential winner is to analyze a combination of pace via interior fractions, turn times, final fraction, velocity, etc. This information will determine which horse(s) have an advantage in relation to today’s projected race ‘shape’: which is determined by computer models based on how races at today’s distance and class have played out given various pace factors, i.e., lone speed; number of ‘early’ runners and/or pressers, etc. The Sheet’s Software will provide you with a strong measure of consistency. Below are two consecutive recent days from Aqueduct viewed via the program’s ‘Summary Report’, which you can generate for all racing cards. 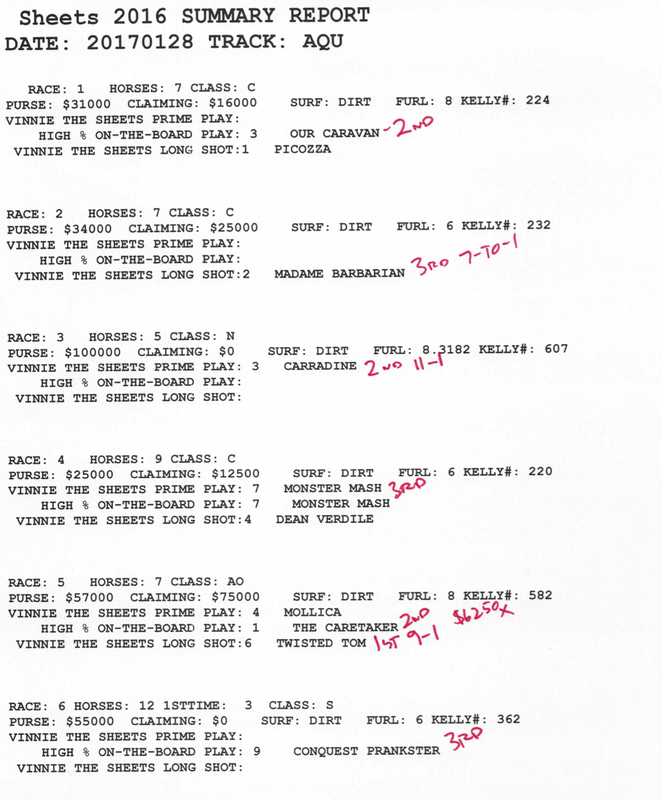 Over the course of 17 races, 15 of these runners ran at least 3rd – most were 1st or 2nd. and 5 won 42% winners at $6.06 average mutual which translates to + 26% R.O.I. but paid $7.20 to place so I used a hypothetical $4.00 for the show price, and an average show price of $2.59. STR1 = A performance number denoting how the horse performed in the stretch (basically focusing on ‘energy, i.e., maintaining consistent position in stretch) The Negative Regression approach is incorporated here. WP = While it may seem obvious, many players ignore the importance of horses who have run at least 2nd in a large % of their starts — Vinnie found that prices are often surprisingly high on what he calls ‘totally obvious horses’. TR = ‘Weighted’ Trainer formula based on proven winning factors. JKTR = Crucial, critical combo formula for Jock/Trainer. This is a factor used by only a tiny % of handicappers, yet it ranks among the top 5 predictive factors in a horse race. CL = Cumulative Class rating — Vinnie has discovered a unique way to quantify Class, i.e., which class factors most often signify a coming strong effort. REC = A very simple Recency factor — based on the fact that 76% of all winners show a race in the past 35 days — Also, horses returning in 7 days or less win close to 39% of the time, and this is factored in as well. STR2 = A formula which measures significant gain in the stretch. 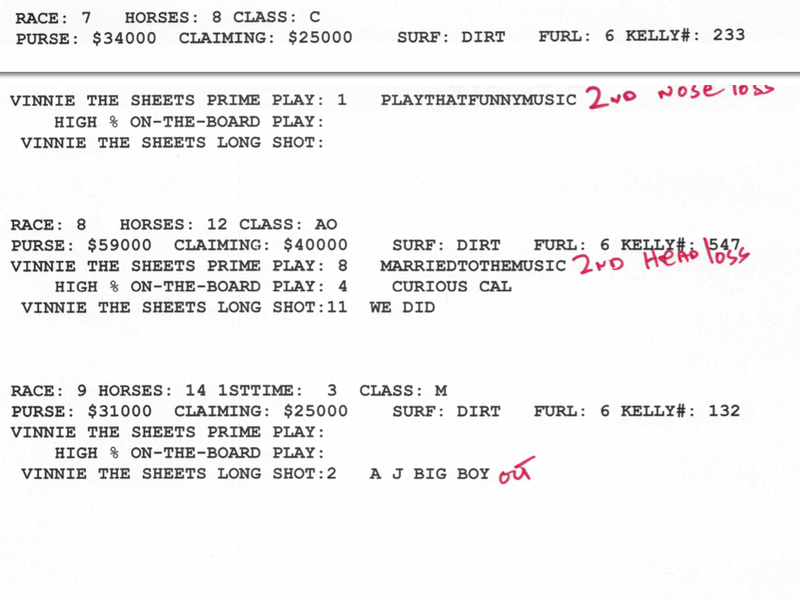 COMMENTS = reasons why a horse is not qualified per the program’s rules. 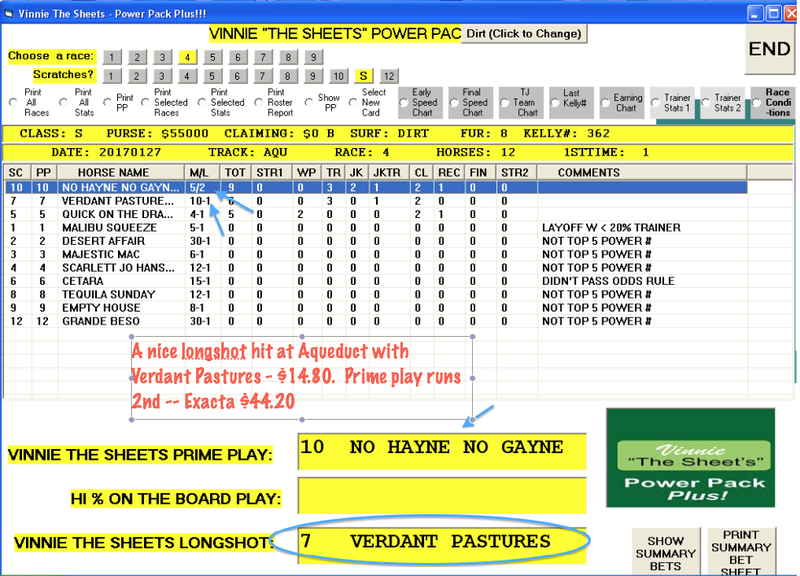 ‘ Not Top 5 Power #’ comment, for example, means that the horse did not qualify because it did not have a Power Number (this factor is not onscreen – it works in the background) among the top five scorers in the race. 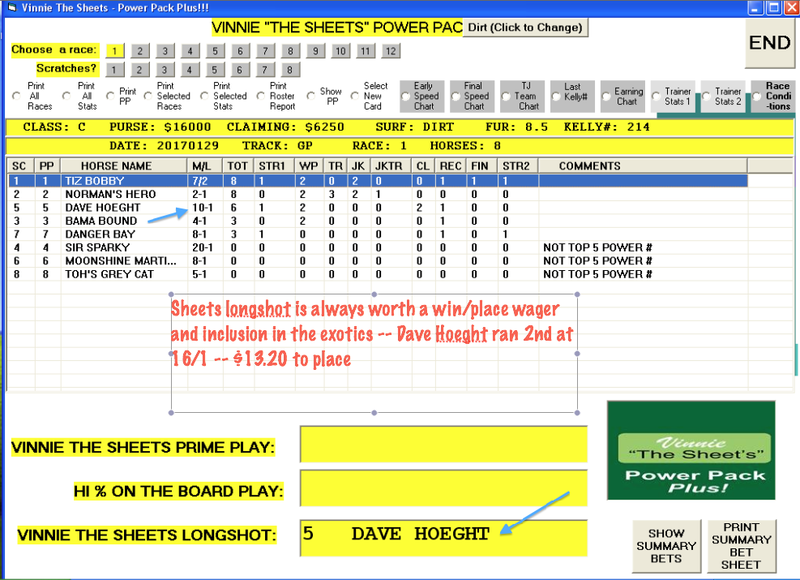 HI % ON THE BOARD PLAY = this is a unique feature that focuses on horses that are very likely to run 1st, 2nd or 3rd. This is another part of the program that works in the ‘background’. 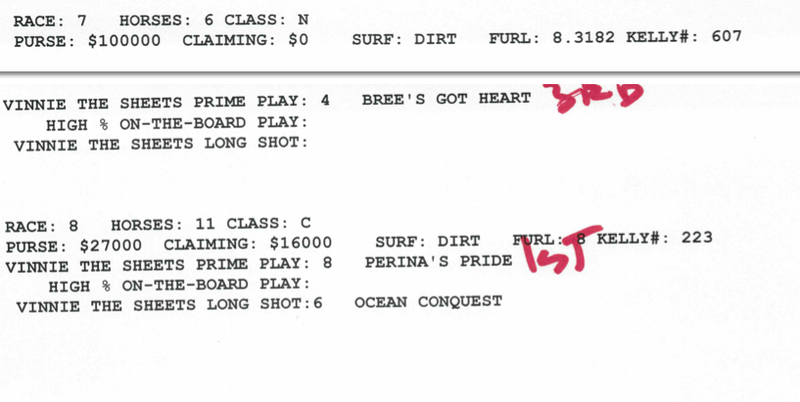 Players like Vinnie look for horses likely to fill a spot in their exotic wagers, and this feature does a great job doing just that. 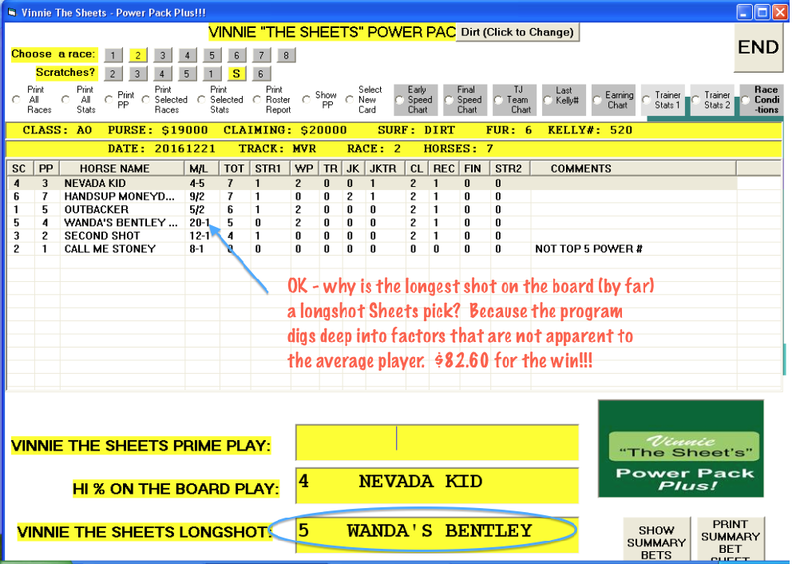 VINNIE THE SHEET’S LONGSHOT = a very clever longshot formula that locates horses who have run big at a price previously and harbors ‘hidden’ trainer factors. One of the beautiful and exciting things about handicapping software is that so many things, and we are often talking hundreds or thousands of things involved in a race, including incremental breakdowns of pace, turn times, inches/feet lost because of trouble, patterns that are invisible to the human brain/eye,etc., are coded to work in the ‘phantom’, or background part of the program. 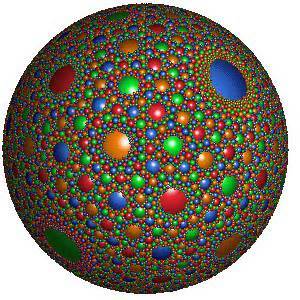 Hundreds of invisible calculations that assist the software in choosing logical horses. And this is very much the case with Vinnie’s program, as an immense amount of brainwork went into the original work, and Len was able to employ what he calls his ‘auto-slicer’, his nickname for the program that breaks important handicapping factors into miniscule pluses and minuses, to hone the selection process to a fine edge. Take a look at some more excellent examples of how the SHEET Software operates. 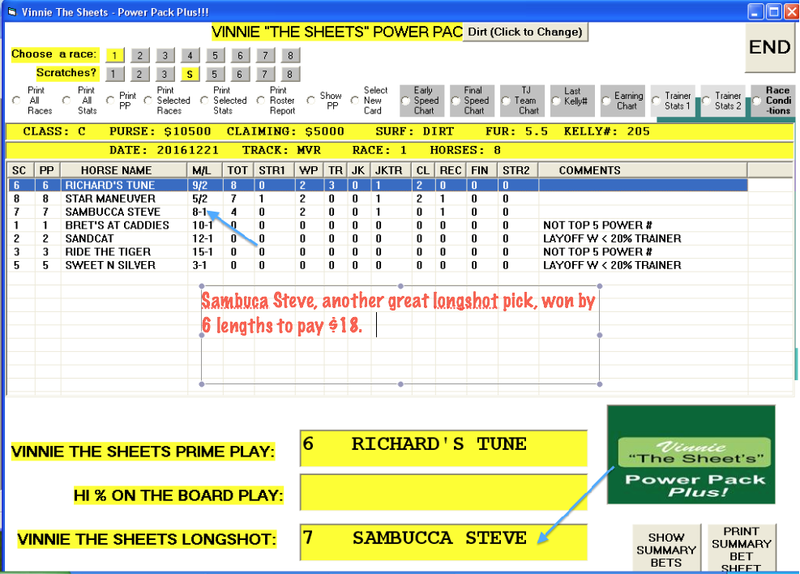 So you definitely want to give Vinnie the Sheet’s Software program a try. It will add a new and exciting dimension to your play. The software is just $137 and, of course carries a full money-back guarantee.